Although slightly off topic, I have linked this topic to the ZX/Spectrum forum too (and provided a Speccy example as well as a couple of bits from here) to see what the 'equivalent' is on said platform. Said topic 'over there' can be found here for the curious. For me at least it will be interesting to compare or see what is done. On topic I had an idea of printing random teletext graphic blocks at random locations on the screen ( simply PRINTTAB(RND etc etc ) , but it tended to add a space after each one, despite trying a backspace code. That may of been quite interesting to watch. Last edited by AndyF on Sun Jul 08, 2018 11:44 am, edited 1 time in total. Wow. What a pleasant find. This is a nice suite of things to test my fork of Brandy BASIC (a BBC BASIC implementation) - and almost all of the pure BASIC examples work fine (the chaos one crashes the interpreter) - and even that one poking MODE 7 screen memory works after a small change (using &FFFF7C00 as the base screen memory address) on my development tree. Edit: Fixed bug in PLOT routine. Thanks! Last edited by Soruk on Fri Jul 13, 2018 10:28 am, edited 1 time in total. Great to see what's been posted so far. Anyone have any more they wish to share ? It would be interesting to see the speed difference for the PET "hat" with hidden line removal, between the Spectrum and BBC. I haven't had time to play yet. Last edited by colonel32 on Fri Jul 20, 2018 4:56 pm, edited 1 time in total. You could very easily sell me a computer if you showed me a picture like that! Thanks for the Speccy thread link @AndyF - if you could possibly post some screenshots to that thread to illustrate what people have done, that would be great for Acorn-centric spectators! I wonder if any trig-happy coder would like to take a bash at a spherical helix? There's a video of a Commodore pen-plotter drawing one, but we don't know what machine or what code is behind it. Wolfram Alpha can show the effect here but it doesn't tell you how to do it - need both spherical trig and some minor perspective effect. Edit: link to pen-plotter thread. Last edited by BigEd on Sat Jul 28, 2018 3:49 pm, edited 1 time in total. Last edited by lurkio on Sat Jul 28, 2018 6:43 pm, edited 1 time in total. I wrote this program this evening, and I think it fits the bill. Eight physical colours on the screen at once in Mode 0. And from the command line as well! Last edited by Andrew_Waite on Sat Oct 13, 2018 1:37 am, edited 4 times in total. I wrote this program this evening, and I think it fits the bill. Eight physical colours on the screen at once in Mode 0! Last edited by billcarr2005 on Wed Aug 01, 2018 2:19 pm, edited 1 time in total. Pressing keys tends to make the colours shift, which is an interesting effect, but perhaps running a small piece of machine code to turn interrupts off before running the loop might be useful. Just had a chance to try it: nice and simple! On JSBeeb there's a gentle wavering to the colour bars, which for me is a win: it shows something is still happening. I see Caps Lock will make the yellow bar bigger: that means the 100Hz regular interrupt is doing a little more work, I think, in this case checking the keyboard. Last edited by BigEd on Wed Aug 01, 2018 5:13 pm, edited 1 time in total. Acorn World is coming up at the CCH (same place and time as ABUG) so that might be a good place to find some unattended Beebs and type in some code. This page collects simple fractals - any of these likely to fall to a one-liner, or a ten-liner type-in? 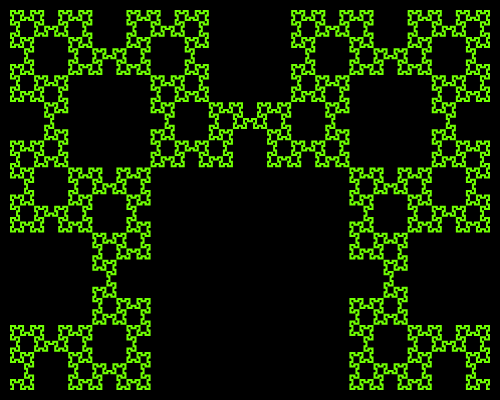 I did a Hilbert curve but that was 31 lines of code, much of it fiddly. So I did this instead. It's much simpler, but really slow. Possibly too slow to be of interest on a real beeb. What you really need is a beeb with some kind of Logo installed. Edit: Changed line 140 so the dragon is the right way up! Last edited by ctr on Sat Aug 25, 2018 12:31 am, edited 1 time in total. I got a sort of leggy starfish made of dots - is that right? It's not what I expected! I can't see that I made a typo. Well spotted! Much better now. Last edited by lurkio on Sat Aug 25, 2018 10:46 am, edited 1 time in total. I made the wrong trade off with the dragon. Having the NEXT before the PLOT avoids pointlessly redrawing loads of points, but also throws away a lot of new points that were expensive to calculate. Just moving the NEXT from before the PLOT to after the PLOT speeds things up greatly. Different scaling on line 130 so it fills the screen. Extended the loop on line 100 so it explores more points. I am pleased with this one, it draws a starfield then planets in the foreground. Last edited by Andrew_Waite on Sat Oct 13, 2018 1:25 am, edited 2 times in total. I am pleased with this one, draws a starfield then planets in the foreground. I like! That's actually *very* good. I first had a DIM Space error on a 'B then realised I had both ADFS and NFS alive and kicking so a quick change around to remove them and all was well! Here is a '10 Liner' program published in Electron User in 1988, putting my then A-Level trigonometry to good use. It draws a helicopter in MODE2 with ellipses with multicolour sectors for rotors, then uses palette switching to make the blades rotate. Last edited by Andrew_Waite on Sat Oct 13, 2018 1:28 am, edited 7 times in total. No worries. I just want these type-ins to be as easily accessible as possible because they're brief, clever and very impressive! This program sets loose lots of Jet Set Willys to march across the screen of the BBC Micro. Last edited by Andrew_Waite on Sat Oct 13, 2018 1:23 am, edited 2 times in total. lots of Jet Set Willys to march across the screen of the BBC Micro.